As usual, MWPAC’s annual New Members Tea and Anniversary Party was a big success, for many reasons. A real cross section of partygoers, longtime members, new members, political candidates, and people who just like a good time, showed up to enjoy “tea,” yes, we had real tea; wine, tiny sandwiches, pasta, salad, and a killer cake. Everyone enjoyed visiting, but then we offered an exceptional program: four inspirational women from the Latino community described their various pathways to successful lives. Lucia Martel-Dow was recently named North Bay’s Woman of the Year. She was notified by Assemblyman Marc Levine’s office that she had been given this honor. She is the director of immigration services at the local Canal Alliance and a longtime champion of human rights causes, in Venezuela, Spain and now right here in Marin County. Other speakers were Magali Limeta, an MWPAC member and former president of Young Democrats; Gloria Estavillo, director of education at Canal Alliance: and Ariana Aparicio, a beneficiary of DACA (Deferred Action for Childhood Arrivals). Each of these women had an exceptional story to tell that kept the audience spellbound; the hurdles they had to overcome, the help they received from many sources, including individual mentors and organizations, and how they were each determined to get an education and find a way to live life as they wanted and serve their communities. A big thank you to Program Chair Barbara Matas for planning the party, providing the delicious food, and putting together such a compelling program. MWPAC is celebrating seven years in existence after withdrawing from the National Women’s Political Caucus when that organization clearly made it impossible to recommend male political candidates. While we only endorse women candidates, we do feel it important to include in our endorsement process enlightened male candidates in races where no qualified woman is running or if there are more open seats in a race than there are qualified women candidates. New Members Tea Party — A Fun Time For All! At our high energy New Members Tea, held on Monday, May 22 at the Falkirk Cultural Center, we honored three very accomplished and dynamic young women office holders. We also welcomed in several new members! Everyone enjoyed a wonderful selection of pasta, salad and diverse appetizers, plus desert, provided for the most part by Program Chair Barbara Matas. The three women talked about how they got motivated to run for office, the challenges of campaigning, and that they feel they can make a difference in their communities by holding a local office. They stressed the time commitment, and explained how they try to achieve balance between their official duties and, in each case, raising a family. MWPAC presented each woman with a certificate commending them on their courage to run for office and make a contribution to the enrichment of their communities. Photo: Left to right: Jessica Jackson Sloan, Heather McPhail Sridharan, and Sashi McEntee display their MWPAC certificates. This popular luncheon, hosted by MWPAC to honor elected women public officials, features guest speaker, Libby Schaaf, Mayor of Oakland, as keynote speaker. Kimberly Ellis, former Executive Director of EMERGE and candidate for Chair of the California Democratic Party. Also speaking is Rachel E. Hundley, Mayor of the City if Sonoma. 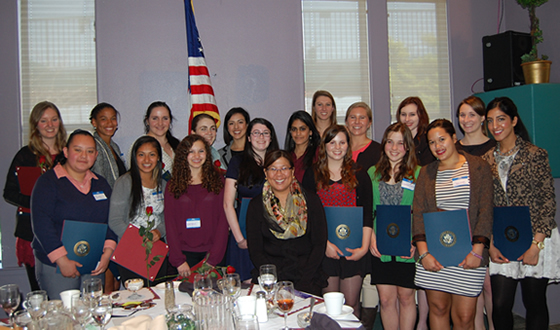 The luncheon honors young women student leaders from local high schools and colleges. On Saturday, July 30, Ed Vorous, one of our board members, passed away after a short illness. Anyone who knew Ed knew what a special person he was. He was funny, charmingly frank, and sincere in his beliefs. He loved helping people and he was “on the job” practically 24/7. Ed was active in several organizations, and we were blessed to be one of them. Ed loved to cook and whipped up meals for many of our special occasions such as our infamous Christmas parties, our candidates’ training sessions, and other events. He found us a venue for events the last few years — the Redwoods Presbyterian Church in Larkspur. We all loved his cookies! Where he found time to do everything, I do not know. He left us much too soon, but he lived life to the fullest and lit up our lives in the meantime. We will miss him terribly. 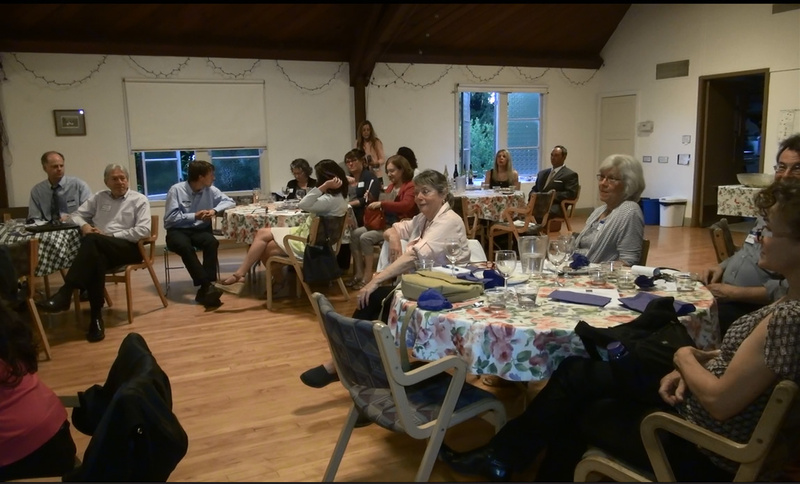 The Marin Women’s Political Action Committee is hosting a Candidates’ Endorsement Night and Reception — covering several June 5 Primary races including Assessor and District Attorney. The event takes place Monday, April 23 with a Candidates’ Reception 5:30 -6:45 pm at In Cavo Wine Tasting and Collective, 1099 4th St, San Rafael. Meet the candidates informally at the Reception before hearing them speak and answer questions during the Endorsement meeting. The Endorsement Night meeting begins at 7:00 pm in the San Rafael City Council Chambers, 1400 Fifth Avenue. The cost for the Reception is $20. Candidates can attend for free. The Endorsement program is free. Public is welcome, However, only members can vote for endorsement. An RSVP for the Reception is requested: (415) 897-1224. Delaine Eastin joins student leaders who were guests at the luncheon. An enthusiastic audience braved the storm to attend MWPAC’s Election Wrap-up at The Club at McInnis Park. It was an evening of lively discussion after dinner was served. Three panelists (l-r) Veteran Radio Broadcaster Peter B. Collins, Democratic Field Worker Pat Johnstone, and Attorney and Political Activist Greg Brockbank spoke on a variety of issues regarding the November 7 election, covering both local and national races. One hot topic was how to get out more voters. Elections in the future will only be held on even numbered years, when there are top of the ticket races. The panel discussed why more people don’t bother to vote. Pat said she knocked on many doors and some of the people she talked to didn’t even know there was an election, or who was on their city council or they got those people mixed up with the County Supervisors. For cost reasons, campaigns focus on households that vote regularly, so those who are not flagged as frequent voters may not get the information that might encourage them to vote, or if they are new to the area, their voting record doesn’t follow them to their new address. It was agreed that nationally Democrats need a strong message. Candidates can’t just run an anti-Trump campaign. Dems have to get out the vote, and vigorously address voter suppression tactics in certain states. The disturbing national events are motivating some people to follow news coverage from first thing in the morning, but others are tuning it all out! Steve Burdo was recommended for the San Anselmo race. Our organization is dedicated to helping women run successfully for public office. In races where there are more open seats than qualified women, members can vote to recommend a male candidate. While this is good news for those concerned with protecting women’s reproductive rights, and indeed, other states with requirements similar to Texas’ are rethinking their position in light of having to defend their unconstitutional laws at great expense. However, Gabriella Jimenez, senior public affairs officer for Planned Parenthood Northern California and Rebecca Griffin, assistant director, California Programs for NARAL Pro-Choice California, outlined the challenges still facing women who wish to terminate a pregnancy in a safe and legal environment. There are still many states that have forced the closure of dozens of clinics providing abortion services. In some states women have to travel over 200 miles to reach a clinic, and in some cases they are forced into waiting periods requiring them to come back to the clinic, an economic hardship for many women seeking abortions. States with extreme laws include a wide swath through the middle of the country, from north to south, but also in every other part of the country. These states are chipping away at Roe v. Wade through numerous laws that make it difficult for clinics to stay open, find doctors willing to perform abortions when they are at risk for personal attacks, protect women who have to walk through demonstrators calling out hateful messages, and operate on reduced funding, among other tactics imposed on them. The event was inspiring to all who attended. Fortunately, according to Rebecca, young women are aware and willing to take up the fight for reproductive freedom that has been going on since Roe v. Wade was passed in 1973. Gone are the days of white gloves and flowered hats. 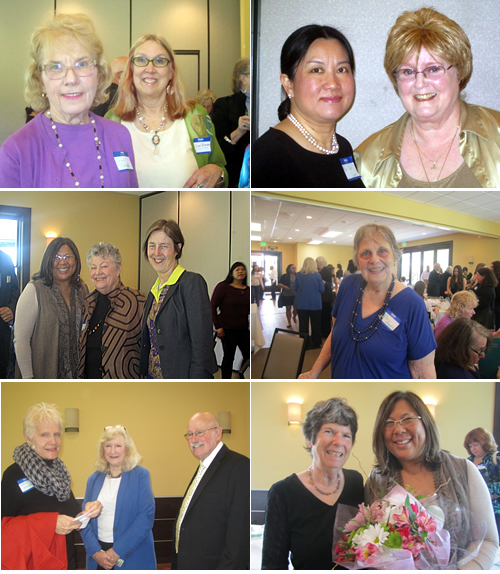 The Falkirk Cultural Center in San Rafael was the scene of much merriment as MWPAC introduced its new members, a number that is growing steadily, along with making a special presentation of an engraved walnut gavel to retiring Judge Faye D’Opal. Guests enjoyed a lovely spread of delicious food, prepared by Program Chair Barbara Matas, along with wine and other beverages. The New Members Tea is an annual event that marks the anniversary of MWPAC, which is celebrating its founding six years ago. At 7:00 PM the Endorsement Forum was held at the San Rafael City Council Chambers.This was an excellent opportunity to learn about candidates in major local races on the June 7 ballot. This forum was free and open to the public. MWPAC members who paid their dues by March 22 were eligible to caucus after the forum and vote in the endorsement process. On Friday, March 11. 2016, MWPAC celebrated at Piatti Ristorante in Mill Valley, The special guest speaker was Jennifer Welch, Chief of Police, SMART. The Keynote Speaker was Roseann Torres, Oakland Unified School Board Director speaking on “Women in Politics-Expanding Our Base”. The capacity crowd also honored student leaders from throughout the county. 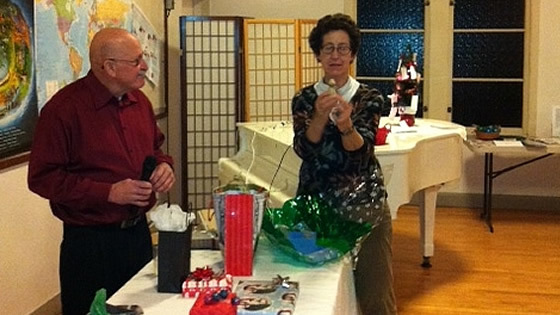 MWPAC held its election for 2016 officers on January 20 at the Redwoods Presbyterian Church in Larkspur and re-elected Gina Brewer, president and Tammi Hull, treasurer. Sharon Jackson was elected vice president and Eliana Reeves, recording secretary. The program committee served a hearty dinner of minestrone soup, pizza and salad and showed the film, This Changes Everything, by Naomi Klein. This was an excellent, inspiring, soul-searching and frightening film about climate change and man’s destruction in the name of progress, and the actions we must take to prevent further damage to our planet. 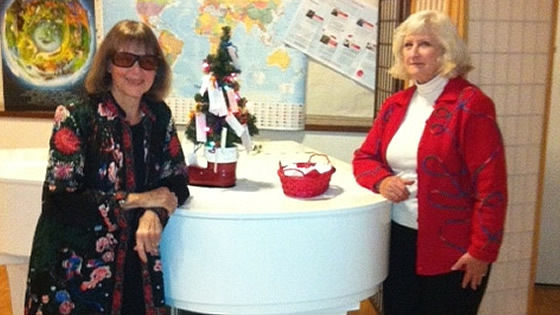 MWPAC held its annual holiday party at the Redwoods Presbyterian Church in Larkspur on Wednesday, December 16. As usual, the evening was full of food, fun, and festivities. The annual White Elephant gift exchange was rousing, as each person chose a wrapped package or “stole” someone else’s previously opened gift. Certain items such as a warm red scarf and pair of salt and pepper shakers, which turned out to be grinders, made the rounds. It’s a wonderful evening of visiting with old and new friends as we prepare for an exciting 2016 election year. In addition, party guests could choose to donate to Book Passage’s Giving Tree, which provides books for underprivileged children. 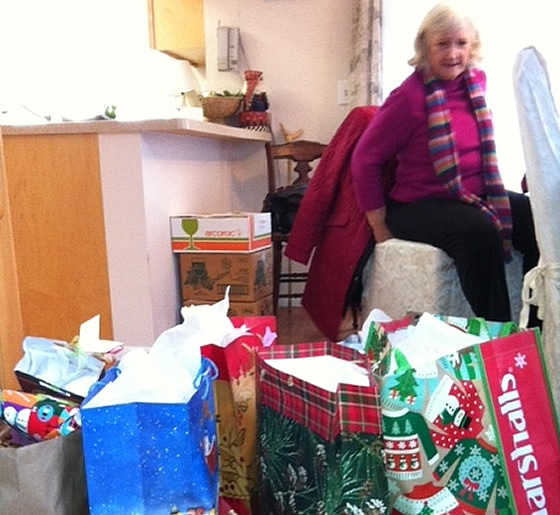 Others donated items or money for Marin County’s Adopt A Family program. A few days later several holiday bags full of presents which were delivered to the county office for distribution to the chosen family. Some 40 people filled the back room at the Brick and Bottle restaurant in Corte Madera on Wednesday, November 11, yes, Veterans Day, to hear three political pundits discuss the results of the November 3 election in Marin. The three included Richard Rubin, political and business consultant and frequent guest columnist for the Marin IJ; Brad Breithaupt, Opinion Page Editor for the IJ, and Jeanne MacLeamy, Mayor of Novato. The consensus was that several issues lead to the very low voter turnout in Marin, averaging around 30% of the voters in any city. One issue is that elections in odd numbered years don’t draw the attention of the even numbered years, especially when the presidential election takes place. Also, voters don’t feel they have enough information to intelligently vote. Only the IJ offers endorsements across the board on many races and propositions. The Pacific Sun stopped doing that this year under new management. The League of Women voters and other organizations include MWPAC do offer endorsements, but voters need to know where to look for the information. One solution might be to consolidate all the races on even numbered years. It would be a longer ballot, but would include more races of interest to voters. Perhaps holding election day on a weekend would be more convenient. Many people vote by mail, but still the turnout was low. Another issue was that some city council incumbents were not returned to office. This could be because the tide is turning as new people move into the county, and the old establishment is eased out. Or it could simply be that voters don’t like what’s going on. All in all, it was a lively evening of discussion, fellowship and good food. This is an annual event that has proven to be very popular with members and guests. A roomful of hopefuls ranging from school district to Congressional candidates heard speakers provide helpful advice on how to run a successful campaign for public office at MWPAC’s Candidates’ Night, June 15, 2015.. Speakers included Dottie LeMieux of Green Dog Campaigns, who gave the nuts and bolts for the local candidate and Lise Stampfli-Torme, a communications consultant, who spoke on creating an effective web site. Laurie Earp of Earp Events and Fundraising talked on how to meet campaign costs; Steve Burdo of Kathleen Russell Consulting covered how to organize a field campaign; and Brad Breithaupt of the Marin IJ and Michele Barni of MWPAC described their organizations’ endorsement processes. Finally, Barbara Coler, Mayor, Fairfax Town Council, shared her experience as a candidate. Two important tips emphasized by the speakers were to develop a realistic budget for your campaign and to try and meet as many potential voters as possible face-to-face to learn firsthand what they think the key issues are in your race. The lively evening, held at the Redwoods Presbyterian Church in Larkspur, began with a gourmet Greek-themed dinner provided by Caterer Suzy Denning. Our New Members Tea was a big success! Held at the charming Margie Belrose Theater in San Rafael, our event honoring new members attracted a good-sized turnout including several high school students and young professionals from the Young Democrats Club, plus other guests who are not members yet, but we hope they will join us soon. Guests learned about the long history of MWPAC and about our mission to get more women elected to public office. With soothing harp music in the background, guests enjoyed tea poured from beautiful tea pots, wine, finger sandwiches, pastries and sweets. 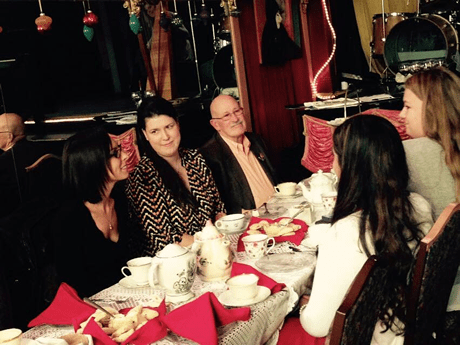 It was a lovely high tea and a chance for everyone to chat and catch up, and meet new people. MWPAC’s annual Elected Women’s Luncheon honoring elected women officials and young women student leaders was a big success. The weather cooperated with a lovely, warm Spring-like day. Some 83 people filled the room at The Club at McInnis Park. Guest speaker newly elected State Controller Betty Yee outlined the many duties of her office, which she has only been in for two months, and the many projects already underway. Speaking to the young women, she emphasized getting some education in finance, no matter what professional field they might enter. Keynote Speaker Nancy Skinner, who was just termed out after three terms in the State Assembly, traced her career, from being the first and only UC Cal student to be elected to the Berkeley City Council, to her future plans to run for the State Senate. She advised the young students to keep in contact with people they meet throughout their academic career and into their early profession. These people can be invaluable contacts through life, she said. The students each received a rose, and proclamations from Congressman Jared Huffman, State Senator Mike McGuire, and Assemblyman Marc Levine. Guest speakers Greg Brockbank, attorney and former San Rafael City councilman; Jeanne MacLeamy, architect and Novato City Council Member, and Brad Breithaupt, Opinion Page Editor of the Marin IJ, discuss the outcome of November 4th, 2014 election, locally and beyond. Approximately 35 people attended MWPAC’s Candidates Training Workshop on Monday, August 18. Considering this is an “off” year with few big races at the local level, we were pleasantly surprised at the turn out at the Redwoods Presbyterian Church in Larkspur. Ed Vorous provided a sumptuous feast before the program, which included presentations from campaign consultants, giving their hard-earned advice about how to run a campaign, and several speakers representing the media, unions and organizations that endorse. It was agreed by the endorsers that candidates have to make public their phone numbers and email addresses so that endorsers can find them. Supervisor Judy Arnold made an excellent presentation on what it’s like to run in a race fraught with controversy. 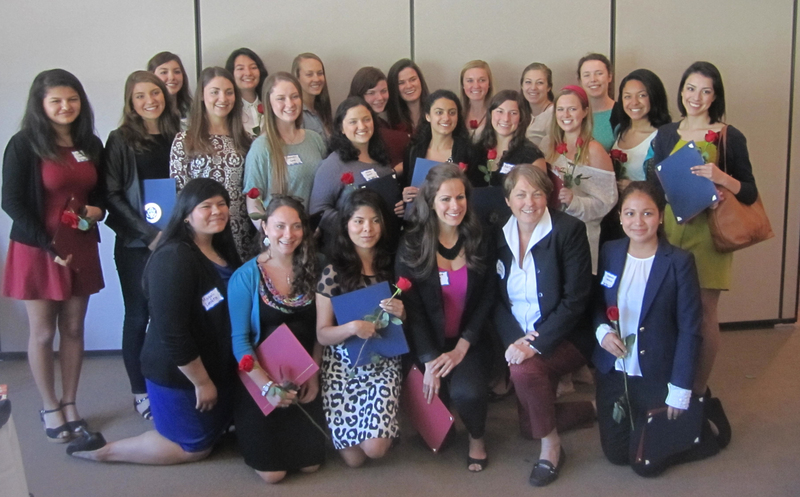 Maureen Sedonaen, CEO of Goodwill for Marin, San Mateo, and San Francisco, Founder of The Youth Leadership Institute, and Board President of Marin’s Center of Volunteer & Non Profit Leadership, with student leaders who were guests of MWPAC at its annual Elected Women’s Luncheon celebrating Women’s History Month in March. Despite a number of competing (or complimentary) events taking place the same night, our 3rd Anniversary Party and New Members reception was a big success. Some people, particularly local officials, party-hopped because of the overload of engagements, but that just added to the buzz. Along with enjoying wonderful food organized by Barbara Matas and Ed Vorous, and drink graciously poured by Gary Tobin, guests honored three longtime members who received emeritus status, Dora Knell, Marvell Hamm, and Eleanor Kellogg-Smith. Ed Vorous received the Volunteer of the Year Award. success in the job market we haven’t reached parity at the top corporate levels or in public office. It has been two years since we began the Marin Women’s Political Action Committee, in response to the National Women’s Political Caucus’ decision to not allow the recommendation of male candidates in political races where no qualified woman was running. We chose to disengage ourselves from that organization and start our own, with all the same talented, enthusiastic, and very active members plus a whole bunch of new talented, enthusiastic and very active members! So, on Monday, May 14, we held our second birthday party at the Falkirk Cultural Center in San Rafael, where everyone who attended had a fine time gossiping, or rather, discussing intelligently, the upcoming primary election, which has several hot local races including for Congress and the Assembly. 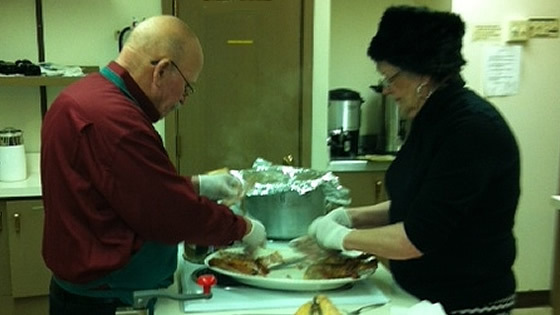 Fine food was provided by Executive Chef Ed Vorous and Sou Chef Barbara Matas (honorary titles). Very desirable prizes were raffled off. And, awards were given to Supervisor Susan Adams, who received the Don and Dori Organ award for her hard work in the county and as a member in good standing with MWPAC. Barbara Matas received the first annual Barbara Matas Volunteer of the Year Award. Sue Severin was honored for her many years of generous participation in NWPC/MWPAC. She will be moving soon to Ashland, Oregon and we will miss her enthusiasm and friendship. 1. A sumptuous buffet greeted party goers. 2. Barbara Matas received her award — a complete surprise. 3. Sue Severin was presented with a bouquet almost as big as she is. and Diane Furst for County Supervisor District #4. The MWPAC has endorsed Marin County Supervisor Susan Adams for the 2nd District Congressional seat. At its Endorsement meeting, held Monday, April 9, eight candidates vied for the honor. It was a challenging evening because some of the candidates had to travel for several hours since the new district reaches up to the Oregon border, but they were a peppy bunch and ready to shake things up in Washington. April 23 at the San Rafael City Council chambers at 7 p.m. Some 90 movers and shakers from around the county flocked to The Club at McInnis Park to hear Assembly Speaker Pro Tempore Fiona Ma and newly appointed County Supervisor Katie Rice, as well as gab with fellow politicos and political junkies, and eat pasta, prawns or London Broil. Being an election year, there might have been more electricity in the air than usual, but there’s no getting around the fact the politicos love to talk with one another, catching up on the latest news, networking, and in general, having a good time. Sixteen young women student leaders from Dominican University, College of Marin and Terra Linda High School were honored guests and received personalized proclamations from Assemblyman Jared Huffman and State Senator Mark Leno. Several of the girls said they were encouraged by The Honorable Fiona Ma’s story about how she was destined for a career in business, but found politics more compelling. Supervisor Rice talked about the inspiration she received from working for the late Supervisor Hal Brown. The luncheon is a fundraiser for MWPAC and a raffle brought in an extra $200 which is earmarked for the political action fund. Ellen Brown is an attorney, president of the Public Banking Institute, and author of 11 books including “The Web of Debt: The Shocking Truth About Our Money System and How We Can Break Free”. David Trujillo, Public Affairs Director for Planned Parenthood,Shasta Pacific Action fund, spoke before a sell-out crowd at MWPAC’s first public meeting of the year. Planned Parenthood is counting on two-thirds of the California legislators, the U.S. Congress, and President Obama to continue funding for the organization. Voter registration is being conducted by Planned Parenthood volunteers to ensure politicians that support women’s health remain in Congress, and win elections instead of anti-Choice candidates. Trujillo highly praised Senators Dianne Feinstein and Barbara Boxer for their strong support of women’s rights. threatening the reproductive health of thousands of women across the country who rely on Planned Parenthood for medical care, said Trujillo. Phone banks made up of volunteers are being set up to persuade the public to lobby politicians who want to stop funding at both federal and state levels. Funds from the public are needed to bankroll this effort. the HPV vaccine which prevents cervical cancer and many other important services for women. For more information, check out www.ppactionca.org. Our holiday party continues to be a popular gathering, filling Barbara Heller’s house with laughter, political banter, good food and plenty of it, along with warm fellowship. Assemblyman Michael Allen joined us, laden with potluck contributions. Guests brought their elegantly wrapped White Elephant gifts, and as usual, the right people got the wrong gifts, so gifts were traded, exchanged and claimed back and forth several times until everybody was satisfied. which provides books as holiday gifts for children living in shelters and other situations of extreme need. A sold-out and spirited crowd heard Vic Canby, longtime Marin Republican political observer, radio personality and progressive political commentator Peter B. Collins and IJ Opinion Page Editor Brad Breithaupt. November 8 election results analysis on Monday, November 14. The event took place at Max’s Cafe, in Corte Madera. Collins, who came armed with election statistics, said he was surprised at the significant percentage of votes separating the two candidates, Greg Brockbank, and victor Gary Phillips, who ran for San Rafael Mayor. He said the issue of the Target store coming to San Rafael, which Brockbank voted against while serving on the city council, was not the key issue among voters that Brockbank had banked on. Canby said he wasn’t so concerned about local politics because he felt the Marin electorate made pretty good decisions, but he felt Obama needed a stronger base of advisors to get beyond his speechmaking and into action. Breithaupt said the IJ editorial board personally talked with over 50 candidates in person to show respect to the candidates before making endorsements. He noted the low voter turnout especially compared to two years ago with the Presidential election. Perhaps, he said, county elections should be held only in even years, when big ticket races are also on the ballot, motivating voters. They all thought the Assembly and Congressional races next year should be very interesting. Thinking of a run this fall or next year? Want to help your favorite candidate? and information packed event that every candidate needs to win. redistricting maps, this will be a whole new ball game. PAC. We endorse and actively support pro-choice candidates! handouts, ads, TV and more – how to tell the voter why you are the one! you will want to be your best when speaking to the public. Twitter and the all important Website. all about. Get out your walking shoes and hit the campaign trail! the terrific women and supportive men who run for elected offices, and whom we support. Here’s to many more years of successful campaigns bringing more women into the political process!